At the close of the last year’s high-goal season, POLO sought out one of America’s legendary players, Memo Gracida. The setting was a fitting one: the Houston Polo Club. There, only days before, Gracida had captained a victorious campaign for the 2003 U.S.P.A. 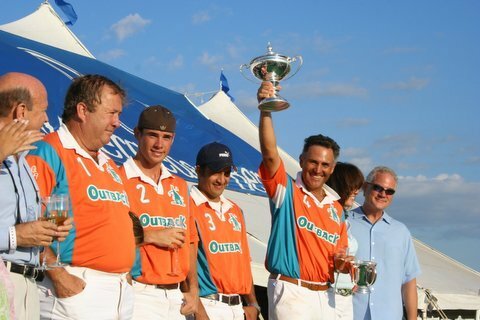 Silver Cup on an Isla Carroll squad that included his 15-year-old son, Julio. More than a quarter of century ago, at that same Texas venue, Gracida played in his first U.S. tournament, the Camacho Cup. As with last year’s Silver Cup, two Gracidas played on the winning team. In 1976, however, it was Memo and his father. Here, in a rare and revealing interview with Eric O’Keefe, one of the world’s pre-eminent players takes a look back at more than 25 years in polo as he reflects on his earliest days in the professional ranks, contrasts the game he once knew with the one that is played today, and shares his thoughts on those who have had the most impact on his storied career. ERIC: It’s been over 25 years since you won your first U.S. Open. What sort of changes have you seen since that first Retama victory in 1977? MEMO: The polo we play today is much more competitive. Back then our whole team might have had 20 or 25 horses. Now 40 or 50 or 60 is quite common. At Retama, Steve Gose had one of polo’s first year round staffs. There were people looking for new horses, people making green horses, all sorts of things that were unheard of back then. Now everyone does them today. ERIC: Dollars-wise, how has your paycheck changed? MEMO: I can remember my very first paycheck. I was so excited to play for $2,000 a month back then. Now the better players get $100,000 a month or more. So the stakes are much bigger and the pressure a lot greater. ERIC: You began playing professionally in 1977, and by 1983 you had become a 10-goaler. What was the key to your success? MEMO: Joe Barry. When I first arrived in San Antonio, I was totally under the direction, tutelage, and management of Joe. If Joe Barry said jump, I jumped. He was totally my mentor in those moments, and I was completely absorbed by thoughts of getting better. I wanted to prove to my father and to everybody that I was going to be a good polo player. ERIC: And now the tables are turned. MEMO: Exactly. Now, I’m the wise one. ERIC: Trying to pass your wisdom along to Julio. MEMO: (Laughs) Some of it. Sometimes I overdo it. You know, I want him to learn so quickly and so fast that sometimes I overwhelm him with too much information. ERIC: The two of you certainly did yourself proud on Sunday by winning the oldest trophy in American polo. MEMO: Oh, Eric, it was so emotional. It was like the little gem on the top of a crown. The last jewel to be placed. If I retired tomorrow and I said that the Silver Cup was my last tournament as a 10-goal player, I would be very happy. I played with my son, we came to win, and we won it. ERIC: Let’s turn from triumphs to tragedies. What’s your greatest regret? MEMO: It would have been great to win a tournament and just have two weeks to really let down and enjoy and really absorb the magnitude. We never did that. It was 50 minutes of exuberance and enjoyment and joy and happiness. Then it was time to start packing. We never really sat down and celebrated or savored all those victories. ERIC: You mean from Palm Beach, it was on to England. From England, it was off to Deauville or Santa Barbara or Argentina. MEMO: Exactly. When you are so involved in the heat of the competition, one tournament was not enough. There was always another challenge right in front of us. ERIC: But that’s what it took to create the legacy you enjoy today? MEMO: You’re right, Eric. Sometimes I look at myself and ask, “How in the hell did I have the endurance and the dedication to win?” So many guys win one tournament, and they are super satisfied. They made their season. They made their careers. That’s it. We did it over and over and over again. ERIC: That was your calling. MEMO: Yes, I wanted to be the best. When I look back at my career, that’s what makes me feel that I did great. ERIC: We’ve talked about Joe Barry and the impact in the early stages of your career. Let’s switch topics and talk about making your mark after you became a 10-goaler. Who was your best teammate? MEMO: I have to tell you that without a doubt the best teammate I had in my entire career was my brother. ERIC: How many Opens have you won together? MEMO: I’ve won fifteen, and more than half, eight, were with Carlos. ERIC: That’s quite a record in itself. MEMO: I’ve played with all the best players – guys like Mike Azzaro and Sebastian and Pite Merlos. Looking back, Carlos was without a doubt the best. He was extraordinary and exceptional: competitive, accurate, fast, aggressive. These are the attributes of a champion. I will never have a teammate of that magnitude. ERIC: You’re lucky to have played with so many Gracidas. MEMO: I am. My father, my uncles, my cousins, my brother, and now Julio. Unfortunately, I think Julio and I are going to run out of time before we get to that level, but when people ask me to name the world’s best player you have to look at Carlos. He was the best player in the world for many years. And I think we complement each other in an incredible way. ERIC: Tell us about the kid your father brought to Houston from Mexico City back in 1976. MEMO: (Laughs) If I had to choose one word, it would be naive. ERIC: In the ways of the world? In the game of polo? MEMO: All of the above. I had only played polo with my father on the weekend in a very family environment. So when I came to Houston, everything was new: the lifestyle, the people, the type of polo, the horses. It was like arriving on a new planet. ERIC: How old were you? MEMO: I was 18, and my father was 56. ERIC: You were on the verge of becoming a much better player, and, given that your team won the Cup, he was obviously doing quite well as a player himself. MEMO: Although he was in his fifties, he played remarkably well. ERIC: Was he playing competitively in Mexico? MEMO: No. Not at all. He was semi-retired, playing green horses and teaching the game very much like Joe Barry. There was no real income in the polo world at the time, but my father loved horses and he loved the game so we played every weekend. ERIC: In 1946, long before you were born, your father and three of your uncles won the U.S. Open. No other band of brothers has done that, before or since. By the time you came along was he still playing high-goal polo? MEMO: Not at all. The first time I saw him at his maximum was when we came to Houston in 1976 for the Camacho Cup. Before that we played all the time at home in Mexico City, but the Camacho Cup was when I saw my father really play polo for the very first time. That’s when I realized how good he was. He had the brain and the talent of a 10-goal player. The only thing that stopped him from becoming a superstar was horses. He sold every good horse he ever made. That was the way players made a living in those days. ERIC: Clearly he was still on his game even in his mid fifties. But you were just a teenager and had no Opens to your credit. What was it like to come to Houston and represent Mexico in international competition? MEMO: These people were like Greek gods to us. Back home in Mexico, I had grown up hearing about the Barry family and the Bob Skenes and the George Olivers and the Cecil Smiths. They were my idols from before I even met them. So I was familiar with the names, but I didn’t know the people. To meet them in real life and play against … I can’t explain it. I had never ever played against a nine-goal player. I never ever played against such horses like the ones they rode. They were indestructible, they were flawless, they were beautiful horsemen, and superbly organized. ERIC: So how did you beat them? MEMO: It was so much more than a game to me. Mexico had always lost to the Americans. They had always beaten us. So it was something beyond just a game. This was my first time to represent Mexico, and I was going to beat them on my first opportunity I had. ERIC: But isn’t that what you try to do every time you play? MEMO: (Laughs) I wanted to play at the best of my abilities. I wanted to become the best player I could possibly become. And I wanted to win. I wanted to win.